Construction has commenced on a new project to develop a biomass combined heat and power (CHP) plant in Duiven. 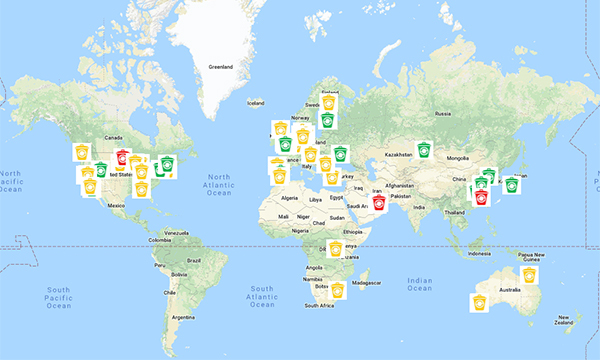 In the week ending 26th October 2018, AcuComm added 16 new projects and updated 32 in our database. These have a combined estimated value of US$6,006 million. There are now 5,471 active projects in the AcuComm database, worth an estimated US$359.7 billion. 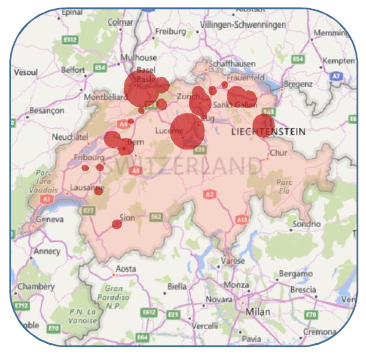 In the latest edition of our Global Waste Investment Fact File, we switch our focus to Switzerland and cover 27 projects in the country. These have a total value of US$1,711 million, an average of US$63 million per project. Incineration (with energy recovery) is the leading project type, accounting for US$1,143 million or 67% of the total. This is followed by recycling which accounts for US$214 million or 12% of the total. The total estimated capacity of these projects is 3 million tonnes. This is equal to 111,372 tonnes per project on average and 50% of Switzerland’s annual waste generation. 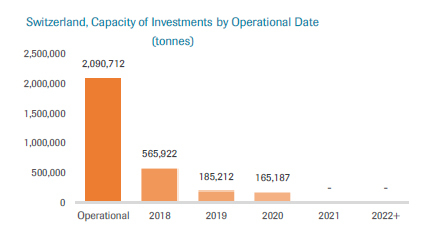 Waste investments totalling US$347 million are expected to become operational over the next few years. This is currently expected to peak in 2018 at US$225 million. See the latest projects in Switzerland. The European Bank for Reconstruction and Development (EBRD) is providing a €15 million loan to I&U Group for the development and operation of a new biogas plant in Kirovohrad. A Notice of Decision has been issued by North East Lincolnshire Council following the approval of a new waste-to-energy (WtE) project in Immingham. The facility is being developed by North Beck Energy, who plan to process up to 500,000 tonnes of household and commercial waste each year. Construction could begin in the next 12 months, with completion expected three years after. Sumitomo SHI FW (SFW) will be undertaking the design and supply of a new 100 MW biomass plant in Gunsan City. The contract includes a circulating fluidised bed (CFB) steam generator, which will burn around 400,000 tonnes of wood pellets each year. Last month, China Everbright International announced that it will be undertaking the Jiangxi Yingtan Waste-to-Energy Project. The facility will have a daily household waste processing capacity of 1,000 tonnes and will generate approximately 114 million kWh of electricity each year. Last month (24th September 2018), NewEnergyBlue announced that it is expecting to finalise a US$170 million deal, for a renewable 16 mgy biorefinery at the Spiritwood Energy Park in North Dakota. The site will feature Inbicon biomass conversion technology – marking the first commercial deployment of the technology in America, to produce cellulosic ethanol and up to 120,000 tonnes of lignin pellets. This latest venture is only the beginning for NewEnergyBlue, with the company hoping to open up many more refineries in the US and Canada over the coming years. It has been revealed that last week (17th October 2018), the Ministry of Climate Change and Environment (MOCCAE) successfully signed a waste management concession agreement with the shareholders of the newly founded Emirates RDF Company, to develop and operate a new US$50 million waste-to-RDF facility in UAE. The project forms part of the first phase of the ‘Energy-From-Waste’ scheme launched in the Emirates of Ajman and Umm Al Quwain and this first phase is expected to cost around US$40 million. Overall, the new facility is expected to convert the waste of 550,000 residents into refuse-derived fuel (RDF); which will be used in cement factories to partially replace the traditional use of gas or coal. Work on the facility is expected to start in December 2018, with operations starting in April 2020. Last week (15th October 2018), Sumitomo SHI FW (SFW) announced that it has been awarded a contract by SK Engineering & Construction (E&C) Co Ltd for design and supply of SMG Energy’s SMG Biomass Power Plant to be located in Gunsan City.